How do I set up my snare drum and my xylophone? The snare drum is placed 8-10 inches from the body, about waist high, and level or tilted slightly toward the player. The proper height places the players' forearms nearly parallel with the floor. The stick head should rest on the instrument, the elbows are at the player's side or slightly forward. 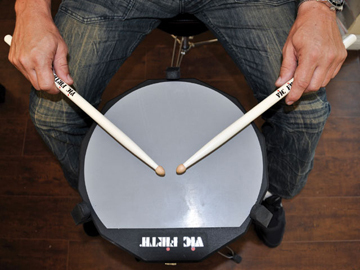 How do I hold my drum sticks and mallets? Find the balance point of the sticks: the spot where the sticks will rebound freely. In playing position the hand resembles an angled "knock-on-the-door" hand position. Where do percussion instruments come from? Percussion consists of the most ancient instruments known. Humans learned to rub and strike objects together before they learned to blow into a reed or pluck a string. The xylophone was once nothing more than a wooden slab or two placed across the legs and struck. How do I take care of my percussion? The snare drum needs to be in its case when not in use. The snares should be left on when the drum is stored. Here are some great hip-hop drum beats. Ideally the lower notes are played with a bass drum and the higher notes with a snare. But, you can also play these beats with just one drum or a bucket.